Heartbreak and other intense feelings of social rejection "hurt" in the same way as physical pain, a new study shows. Researchers found that being rejected activates the same region of the brain as physical pain. "These results give new meaning to the idea that social rejection 'hurts'," said Dr Ethan Kross, a social psychologist at the University of Michigan. "On the surface, spilling a hot cup of coffee on yourself and thinking about how rejected you feel when you look at the picture of a person that you recently experienced an unwanted break-up with may seem to elicit very different types of pain. "But this research shows that they may be even more similar than initially thought." Functional MRI scans of the participants brains were done as the participants completed two tasks - one linked to their feelings of rejection and the other to the sensation of physical pain. Participants looked at a photos of their ex-partner and were asked to think about how they felt when they split up or others featuring a happy occasion with friends. For the physical pain task, heat was applied to their forearms with a probe, similar to holding a very hot cup of coffee. The researchers, from the University of Michigan, found that both emotional and physical pain activated similar areas of the brain. "We found that powerfully inducing feelings of social rejection activate regions of the brain that are involved in physical pain sensation, which are rarely activated in neuroimaging studies of emotion," Dr Kross said. "These findings are consistent with the idea that the experience of social rejection, or social loss more generally, may represent a distinct emotional experience that is uniquely associated with physical pain." The researchers hopes the findings will offer fresh insight into how intense emotional pain can lead to various physical pain symptoms and disorders. They also pointed out that the findings affirm the wisdom of cultures worldwide that use the same language—words like "hurt" and "pain"—to describe the experience of both physical pain and social rejection. The findings are published in the journal Proceedings of the National Academy of Sciences (PNAS). Let's start at the beginning. What is Stress? a state of mental or emotional strain or tension resulting from adverse or very demanding circumstances : he's obviously under a lot of stress | [in combination ] stress-related illnesses. • something that causes such a state : the stresses and strains of public life. The trouble with stress is that it's not a universal level, everyone has their own threshold i.e. what is stressful to one is positively fine and stimulating to another. WHAT HAPPENS TO US WHEN WE ARE STRESSED? Well this goes way back to the times when we were developing as humans and in early periods in history. The body's chemistry was designed to protect us with "The fight or flight response". For example man sees a big bear approach what does he do? he either tackles it or he runs off. Nature is very clever and gives us the capacity to do this. However in 2011 we no longer have the bears, wolves, etc. (ok some of you may) like of yesteryear we have different stresses. 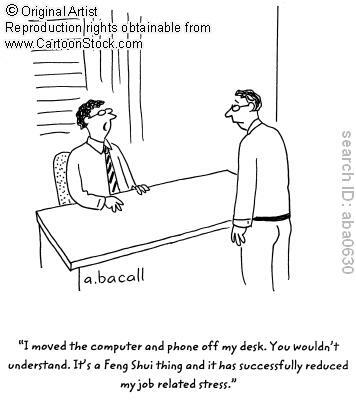 Your work colleagues or your neighbours may annoy you but you can't fight them, nor can you run away, but you can learn to deal and dissipate your stress levels so that it doesn't impinge on your health. But firstly we need to deal with the science bit for if we understand the physiology of stress we're half way there to solving the impact stress has on our lives. Deep within the brain we have an area known as the Hypothalamus (1), its the home of our moods and emotions and a very primitive part of the brain. The Hypothalamus is also the area that maintains equilibrium in our bodies and it maintains and regulates every bit of our body's chemistry. It is the area that controls the Endocrine system, it forms part of the Autonomic Nervous System and part of the Limbic System. It is Hypothalmus that is the key to managing stress and all its detrimental effects on our mind and body. It is directly through this area that the holistic therapy Aromatherapy works and is managed by other holistic therapies. Since the Hypothalamus is the home of moods and emotions anything that affects these will influence the Hypothalamus, thus will have an effect on the body's equilibrium. 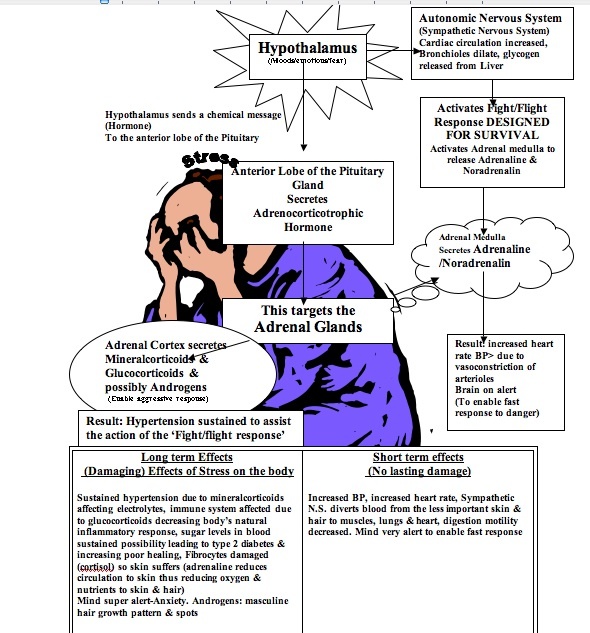 Now if we are stressed and modern stressors are not the same as those stressors we had as we were evolving as humans, they still have the same effect resulting in "the fight or flight response"
The Hypothalamus is the part of the brain that controls the endocrine system. The Pituitary gland lies beneath the Hypothalamus and it is this that controls the other endocrine glands. SO WHAT HAPPENS IN THE FIGHT OR FLIGHT RESPONSE? Moods/emotions affect the hypothalamus, the hypothalamus evokes a reaction on the anterior lobe of the pituitary gland. 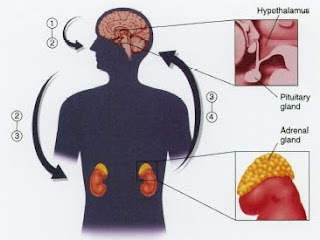 The pituitary gland produces Adrenocorticotropic hormone this in turn targets the adrenal glands causing them to secrete Cortisone, Cortisone in turn effects the kidneys causing a rise in blood pressure by causing changes in the amount of salt secreted, this hormone causes the body to retain salt. Now remember the Hypothalamus one of its jobs is to maintain the body's equilibrium, it detects a rise in salt levels in the blood so to keep balance it causes the body to retain fluid, it is this retained fluid that increases blood pressure. At the same time, the Hypothalamus being part of the Central Nervous System evokes what is known as the Sympathetic Nervous System this diverts blood away from the digestive system and to lesser important body structures such as the skin and concentrates the blood to the heart, lungs and muscles. 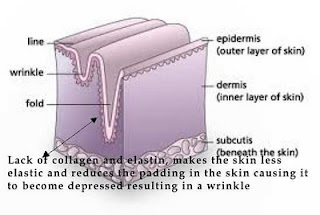 Simultaneously this nervous response influences the adrenal glands to produce Adrenalin and Noradrenalin, it is these hormones that induces vasoconstriction (reduces the blood supply) to the skin and peripheral tissues, thus also raising blood pressure. Now this is putting it simply there are a few other processes also going on to increase blood sugar to give the body fuel to either run off or fight, Corticotrophic hormones influence the pancreas to secrete glucagon this has the opposite effect as insulin. When the stress is over the Parasympathetic Nervous reverses the process again it is the Hyptholamus that instigates this. Obviously its much more complex than this and I have focused on a few key hormones as it the action of these hormones that affects our well-being, the ageing process and blood pressure. The fight or flight response was not designed to last forever it was meant ti instigate an action to deal with an aggressor, be it a wild animal or in a fight with an attacker therein lies the problem modern stressors tends to be work, work colleagues etc. the stress becomes long acting, this kind of reaction is fine in the short term but very detrimental to the body in the long term. Stress The dictionary definition of stress is: a constraining or impelling force, effort or demand upon physical or mental energy. A stressor is a person or situation that makes you become stressed. We are more likely to suffer stress in society today than that of our ancestors. 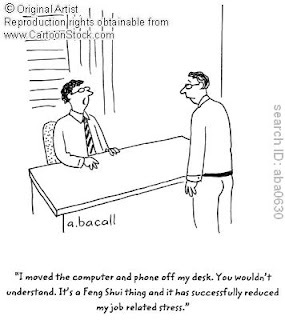 70% of all illness to day is now directly attributed to stress. Modern society with all its pressures traffic congestion, over-crowding, noise, fears and general uncertainties about work, mortgages and family life present situation after situation where the state of stress is ever present. Stress is an everyday part of modern life, everyone experiences at sometime or another and everyday stresses are not necessarily harmful. A certain about of stress keeps us motivated and stimulated to make life more enjoyable and interesting. It is the effect of long-term stress that can be positively harmful to our bodies. When do stress levels become harmful? • Family Problems Have been identified as the most likely to cause negative or harmful stress. • A child starting school or University May cause you stress and can ultimately lead to illness. Your personality and coping mechanisms will largely determine how you deal with these daily stresses and strains. 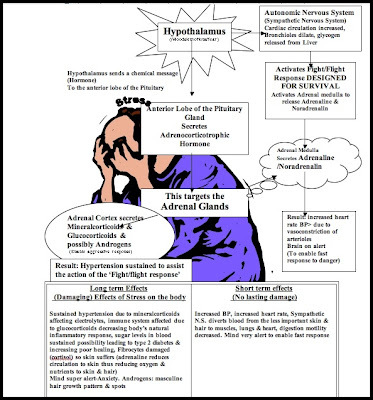 Cortisol is a steroid hormone produced within the adrenal cortex in the adrenal glands, these are cone shaped organs sitting on top of the kidneys. It's a very important hormone and responsible for proper glucose metabolism, helping regulate blood pressure, has a part to play in insulin and blood sugar levels and is part of the inflammatory response. It's often known as the stress hormone but as you can see that's only part of its functions, and this is because it's secreted in higher levels as part of the 'Fight or Flight response'. When secreted in short bursts its beneficial to the body as due to it's actions, it helps mobilise energy reserves, heightens memory and lowers response to pain. This is how and why it's beneficial in the 'Fight and Flight response', it acts quickly and helps survival, however today's stresses are not the same as yesteryear and therein lies the problem. 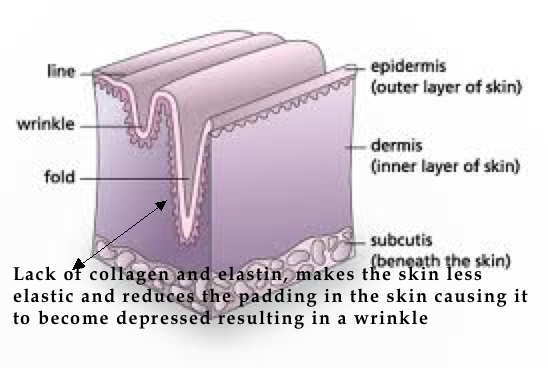 When there is prolonged secretion of this hormone, when stress is on going, it causes blood sugar imbalances, affects bone density, causing it to decrease and also causes a decrease in muscle tissue. It raises blood pressure affects the body's immune system making us more susceptible to infection and leads to poor healing. It also causes shifts in body fat by increasing more fat around the abdominal areas and leads to higher levels of cholesterol. Below the flow chart illustrates how our minds' emotions and feelings trigger a reaction in the Hypothalamus to instigate what happens in the 'Fight or Flight' response. The Hypothalamus then in turn influences both the Autonomic Nervous System and the Endocrine system. This is fine short term it helps us cope in dangerous scenarios and was designed as a protective response, however the stresses of today are not those of yesteryear. No harm comes to our bodies in the short term, this is not the case in long term stress. All is not lost for there are ways we can influence the Hypothalamus to prevent the long term damaging effects of stress on our health. I shall be exploring this under Holistic Therapies.